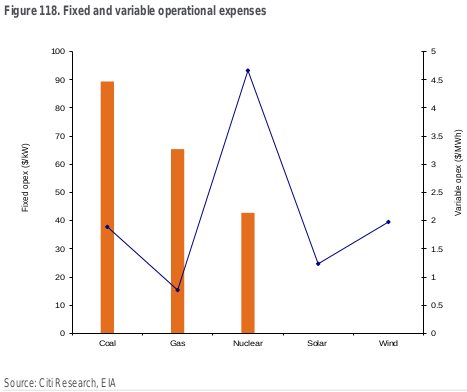 Added to these cost benefits is the lack of pollution which is also becoming a key driver in markets such as China, where the preponderance of coal-fired generation is having a noticeable impact on air quality. Solar’s negligible opex is not just no fuel: it’s also no emissions. Given how fast the climate is changing here in the southeast, including droughts and pine beetle infestations, less greenhouse gases through solar power is important. Solar costs less to install than any other power source, and then requires no fuel. And no 500-mile gas pipe gash through the countryside. Perhaps most importantly is the evolution of each of these industries, fuels and technologies. Solar is exhibiting alarming learning rates of around 30% (that is for every doubling of installed capacity, the price of an average panel reduces by 30%), largely due to its technological nature. Wind is evolving, though at a slower ‘mechanical’ learning rate of 7.4%, and gas is evolving due to the emergence of fracking and the gradual development and improvement of new extraction technologies. Conversely, coal utilises largely unchanged practices and shows nothing like the same pace of evolution as the other electricity generation fuels or technologies. 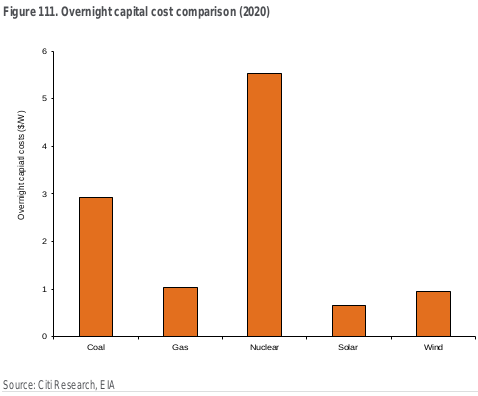 Nuclear has in fact seen its costs rise in developed markets since the 1970’s, largely due to increased safety requirements and smaller build-out. The most the report says about gas learning rates is it’s “gradual”. Sure, fracking came on quickly and swatted down king coal. But that was a one-time technology innovation, and it’s done. While solar keeps learning. Implication: solar is going to beat gas even faster than gas beat coal. And that’s already started. No wonder that’s “alarming” to the fossil fuel industry. We use learning rates in the context of this note to describe the speed at which technological or manufacturing improvements reduce the cost of electricity from a particular type of generation (e.g. solar) relative to the cumulative installed base of that generation technology. In this context, a learning rate of 10% would mean that for every doubling of installed capacity, the average cost (or price) of that capacity would decrease by 10%. They base their learning rate on doubling of capacity. And solar doubles installed capacity in the U.S. in less than two years at its current 60+% annual additional capacity rate. 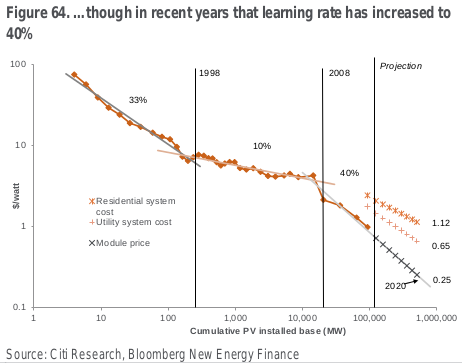 Which would mean that at a 30% learning rate, solar prices should drop by 60% in less than two years. Which is what’s actually happening. And the real current learning rate isn’t 30%: it’s 40%. While the world of energy is constantly evolving, we believe that the last five years has seen a dramatic acceleration in that rate of change and, more importantly, that the pace of change is set to at least continue if not accelerate further. Simplistically, we believe that certain power generation technologies are evolving — most notably gas via the shale revolution or solar via technological and manufacturing advances — while other technologies such as wind are evolving much more slowly, with some such as coal showing more limited evolutionary change. Given the long term nature of investments in these technologies and fuels, we believe that the pace of change will have a profound impact on the returns of both upstream and generation projects. A case study of Germany where the generation landscape has been radically altered in just the last five years shows this is not a ‘tomorrow story’ — it is happening now, and while it will take longer to impact emerging markets, it will impact an increasing number of industries and countries going forward. Solar is already at grid parity (see pages 49, 50, and 54), and learns far faster than any other power source, so why would anyone with any responsibility for public policy, balance of trade, or environmental conservation, bet on LNG exports? Or natural gas as a long-term domestic power source, for that matter? Tearing up our southeast woods, wetlands, farms, and back yards to feed gas plants in Florida or LNG export terminals for short-term profit by a few industry executives and investors is not something any responsible local, state, or national government should support. Given the long term nature of upstream fossil fuel and power generation projects, this substitutional process and the relative pace of evolution is vitally important to understand. The sums of capital being invested are vast; the International Energy Agency (IEA) forecast that $37 trillion will be invested in primary energy between 2012 and 2035, with $10 trillion of that in power generation alone. Clearly the value at risk from plant or the fuels that supply them becoming uneconomic in certain regions, both in terms of upstream assets and power generation, is enormous. This analysis of ‘Energy Darwinism’ as we have chosen to call it highlights the uncertainties and hence the risk inherent in upstream projects at the upper end of the gas cost curve, in the coal industry overall, for utilities, and for the power generation equipment manufacturers. These changes and risks will affect any investor, developer, owner, producer or consumer of energy which, given the sums of money involved, makes it of paramount importance to understand. Translation: if you bet on shale gas for longterm power generation, you’re going to lose your shirt, and it may not take a long time for you to lose it. …We are currently in the midst of a more balanced energy mix but as conventional fuels become gradually more scarce and expensive and as new technologies improve, the long term transformation becomes more inevitable. In summary, we believe that the global energy mix is shifting more rapidly than is widely appreciated, and most importantly that consumers face economically viable choices and alternatives in the coming years which were not foreseen 5 years ago. Accordingly, we believe that long term investment into some conventional fuels must be considered in the context of at worst the risk of substitution, or more likely lower demand than might otherwise be expected, with implications on prices and hence returns of those upstream projects. Moreover, the further up the cost curve conventional fuels are, the higher these risks associated with that investment. Investing in a project with an assumed 25 year life, when new technologies will be competing with that fuel in the first quarter of that project’s life entails significantly more risk than we believe is widely recognised. There will always be more subjective choice factors involved such as fuel diversity and energy independence that may offset cold, hard economics, but investors, companies and governments must consider the sea change that we believe is only just beginning. A quarter of 25 years is 6.25 years, and they repeatedly refer to the changes that just happened in less than 5 years. So the “long term” they’re warning about is as soon as the next five years or less. Infrastructure spend has been centered on “conventional” technologies (coal, oil and gas) keeping risks to upstream projects lower. / Energy substitution away from conventional towards renewables and the pace of evolution is vitally important to understand as the value at risk from a plant or the fuels that supply them becoming uneconomic in certain regions — both in terms of upstream assets and power generation — is enormous. Citi GPS says it’s “inevitable” that renewables (solar and wind) will win, and understanding how fast is “vitally important”. And they’re just talking about economic consequences for energy companies. It’s even more vitally important for those of us who have much more immediate and local risks. Why should we bet our property, environment, or communities on somebody else’s very short term profit? The impact of energy decisions taken by corporates and governments in power generation will have an impact on the upstream providers of the fossil fuels on which these plants will (or won’t) run, affect the demand for these commodities, as well as the price and the likely returns on upstream investments. Make it harder for gas pipes to come through here and their pushers will find them uneconomic and pack up and leave. We right here in Georgia, Florida, and Alabama can refuse to invest our land and communities in a bad bet gas pipe and invest in solar power instead. That small swing could change the whole power industry. Distributed solar and energy efficiency both spell jobs right here where we need them, with reduced electricity bills and clean air and water. No pipeline. Solar now for the sunny southeast! what color is the sky in your world?? when you flip the switch you expect the lights to come on, right? You are being fed lies by people who have NO CLUE about how things really work! Creating electric energy, upon which we all depend takes an enormous amount of energy,,,,, solar, wind, butterfly wings, whatever, CANNOT do it and they are no where near the day in which they can do it. Reject present technology and you will sit in the dark and the cold.